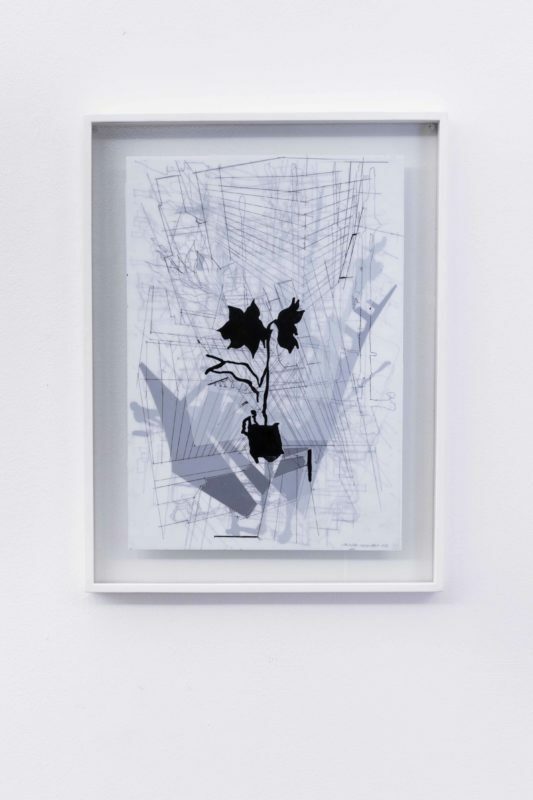 David Krut Projects is excited to announce an upcoming exhibition Polygraph by Lorenzo Nassimbeni. 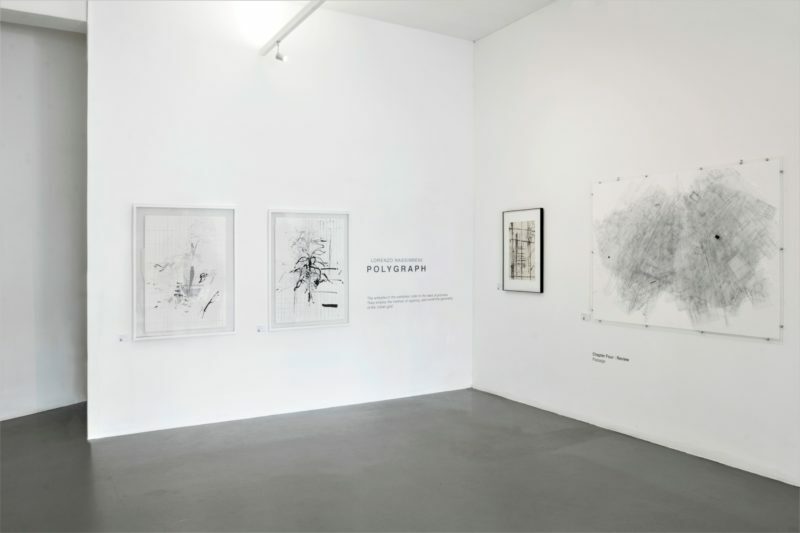 The exhibition is a portrait of the artist, composed of varying qualities and languages of line work which are reflective of his response to various physical environments and contexts. 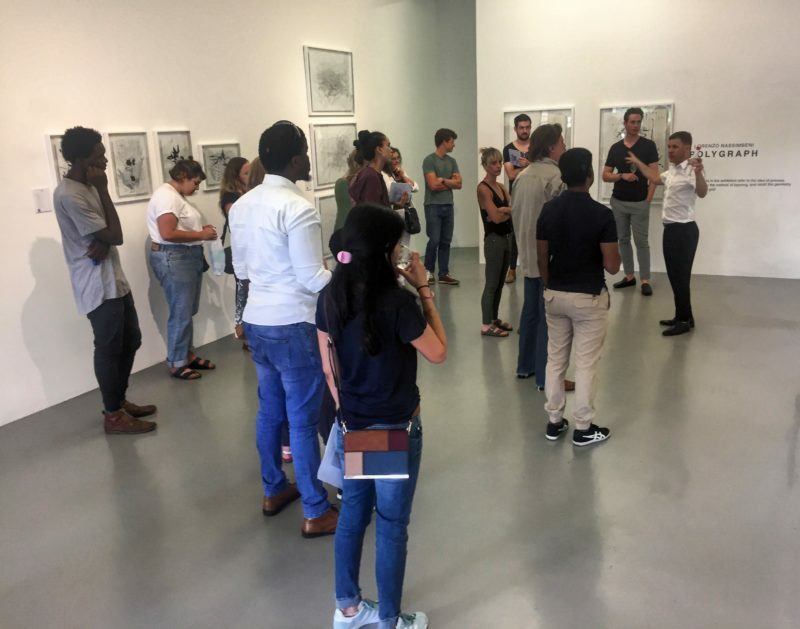 The work in the exhibition is made up of 4 distinct chapters which are structured as a linear narrative – a journey from one form of urbanity or place to another as experienced by the artist. As the journey progresses, so the line quality, and its message, changes. The line is a barometer of the personal condition of the artist, in response to place. Much like in the instance of a polygraph, the line changes depending on the pulse of the artist. This pulse is a reflection of Nassimbeni’s attitude to a place. The architecture of place is considered as well as felt, guiding the line intuitively. 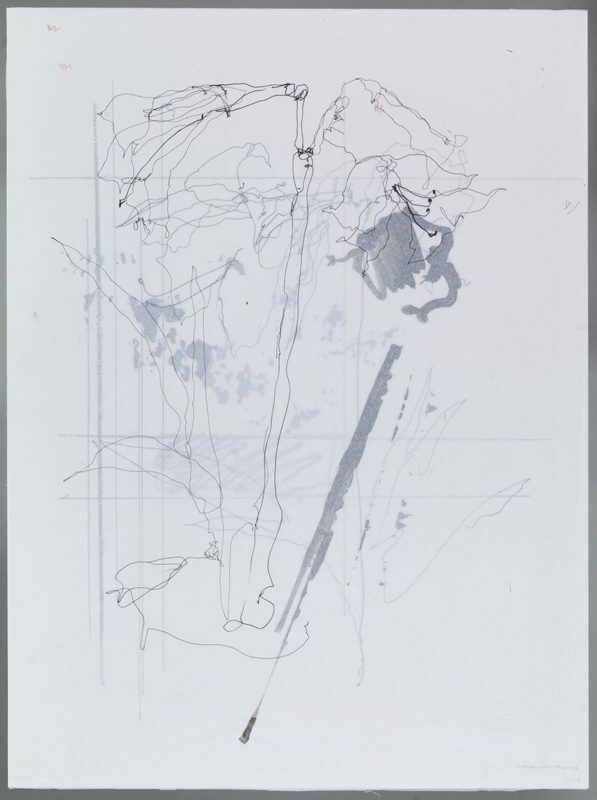 The works seek to uncover the idea of ‘the process of making’, and the discipline of printmaking. The layering of paper brings focus to the quality of line and process of the building of an image. 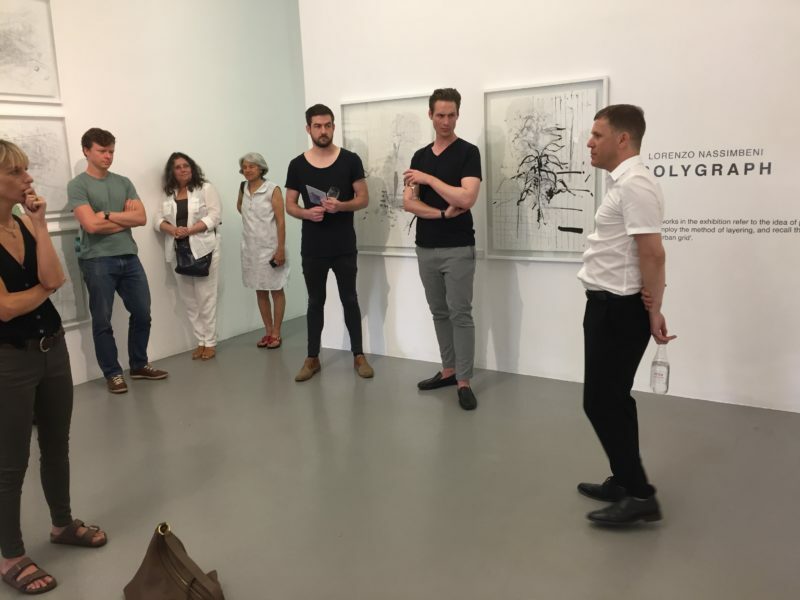 These are principles inherent in the discipline of architecture and urbanism, as uncovered by the process of drawing and printmaking. There are four points along the journey. The first point is the heart of urban Johannesburg, the land-locked city, and in particular, Hillbrow. The works here are prints from the Falling In series. In the Hillbrow condition, the rough, gritty urbanity of present-day Hillbrow is shown with a large organic line, whilst the delicate pristine drafted line reminds on of the prefect modernist beginnings of the environment. 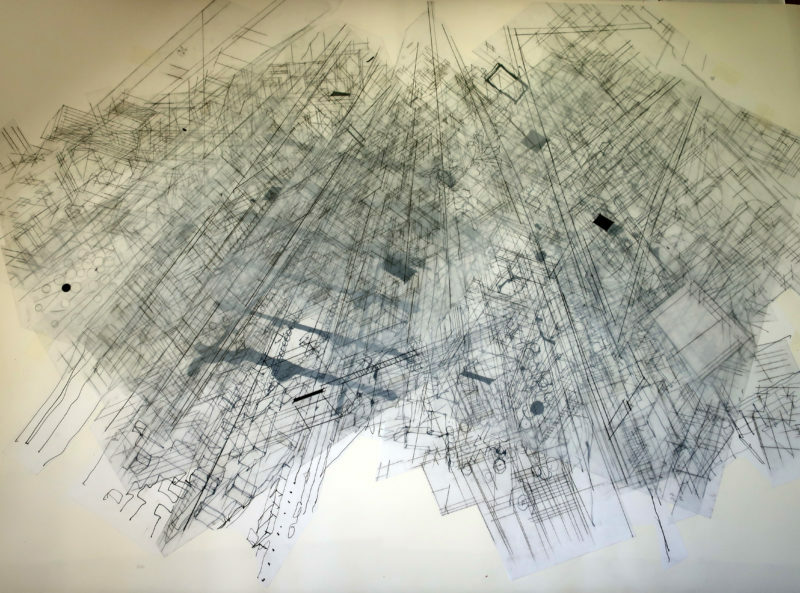 The urban space is represented by a variety of layers, in a printmaking process. This point in the journey represents the origin of the exhibition, and the artist’s love of Johannesburg. The second point is occurs in New Doornfontein, near Hillbrow. The notion of layering is extended into this body of work. The work, like the Falling In series, investigates the artist’s comparative response to the harsh, dangerous, enclosing environment. The work differs from the Falling In series in that it is created not through a process of looking at the surrounding urbanity, but through a process of sensing and remembering, and working with multiple layers of paper, rather than a series of copper plates as in the printmaking process. The discipline of printmaking is alluded to and honoured in this way. 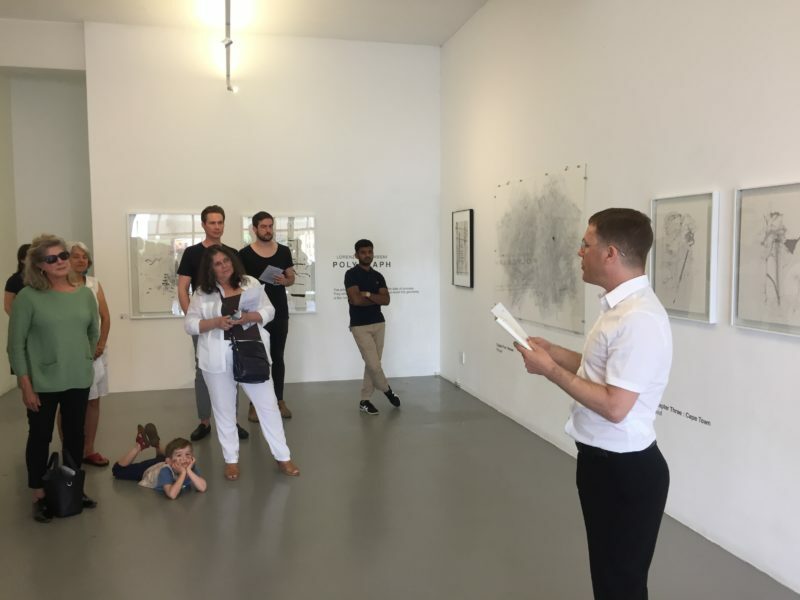 True to linear time-based process, the third point along the journey describes the artist’s response to the open, natural urbanity of Cape Town. An abrupt departure from the interior of the country led him to a space bound by ocean and flora. The line is soft and peaceful. The layering process is continued, showing continuity of language. This occurs due to the momentum of the strong experience gained in Johannesburg. 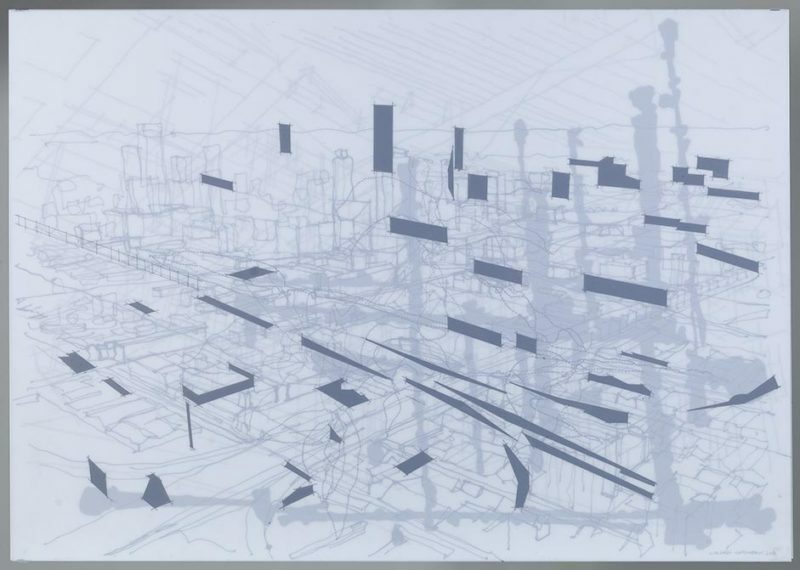 There is evidence of the memory of the industrial grid of Johannesburg, as seen in the drafted line and layered technique. The motif of the flower is selected to carry the line and express the emotive response to the gentler city. The final point along the journey is one of summary and reflection. From a personal position, Nassimbeni seeks through a series of drawings to reconstruct a memory of Johannesburg. This reconstruction is made with line types which are extracted from the first 3 points of the journey. Line qualities from the Hillbrow, Doornfontein and Cape Town chapters are used in composing a retrospective image of Johannesburg which show an emotive response to place. A nostalgia for this great city, and homage to it, is evident in the grid-like geometry of the drawings, whilst the motif of the flower reminds one of the comparative experience of calm registered by the artist. The grid tends toward the chaotic, whilst the flower depicts a moment of clarity and escape. An existence between 2 worlds is thus alluded to. Angel, 2018. Pencil, pen and acrylic ink on drafting film. 119 x 182 cm. The word POLYGRAPH is derived of 2 words- ‘poly’ meaning ‘many’, and ‘graph’ meaning ‘writing’. The collection of many images layered onto one another is about the creation of a language of line which tells the story of the artist’s emotive and cerebral response to varying types of urban environment, and in particular, the two which have been most present in his recent linear journey. In all, the artworks are a series of portraits of places made of lines which represent the artists response to those places. As such, the portraits of the places work together in the presentation of a portrait of the artist. A looking forward, and a thinking back, 2018. Acrylic ink on tissue paper. 100 x 70 cm. Installation shot of Polygraph at the David Krut Gallery, 142A Jan Smuts Avenue, Parkwood.